Maybe you've noticed, but my food photography skills leave something to be desired: No matter how deliciously appealingly appetizing the dishes I prepare look in person, as soon as I so much as point a camera lens in their general direction, they suddenly start to look like dog food... after the dog ate it. 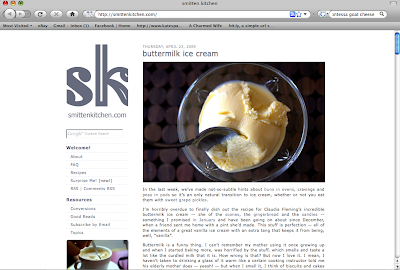 Someone who doesn't suffer from the same impairment is Deb, the woman behind food-blog-to-end-all-food-blogs Smitten Kitchen. She is not only a great cook, but a charming writer, and a terrific food stylist/photographer, to boot. The only thing I don't like about her blog is how I always have to get the mop out to clean up the puddle of drool I have left on the floor after I look at it. It's very inconvenient. No, but seriously, her recipes are inspirational and aspirational, and with clear instructions and photographs, they are also totally attainable for average home cooks like yours truly. So check it out- just try to resist licking your computer screen. I dare you. This is my FAVE cooking website!! Aw, thanks so much! My apologies for the drool puddles. Oh wait, I'm not sorry.